The baseball season in the U.S. has begun! This promises to be another exciting season. With the addition of instant replay, maybe the umps’ poor calls won’t change the outcome of games. My Yankees open up in Houston this Tuesday. We will be celebrating Derek Jeter in this, his final season. Meanwhile … WE INNERUPT THIS POST TO BRING YOU BREAKING NEWS!!! My funky green ball has been located. After weeks and months of allegedly scouring every inch of our condo, the ball turned up under TW’s bed. TW claims to have looked under her bed many times without success. It was jammed between two of the under bed boxes. We don’t know how I came in possession of the green ball. TW thinks it was part of a package I got quite a while ago from Mariodacat. I love this ball so much that I was no where around when TW tried last month to photograph the ball. By the time, the shutter clicked, this is what the pic looked like. 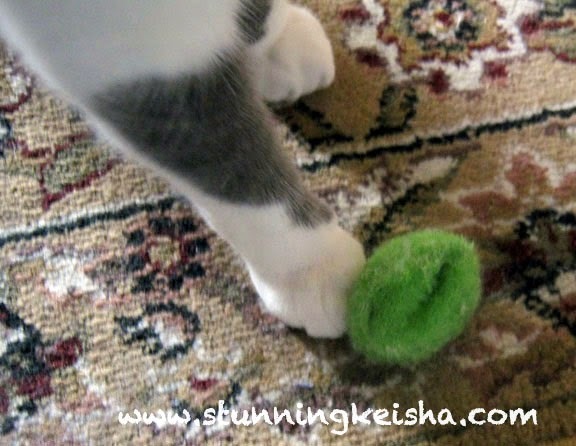 Early yesterday morning, I was heard running through the condo playing with my green ball. I batted it! I threw it in the air! I gleefully chased it all over to give it the what-for. Life is good again. 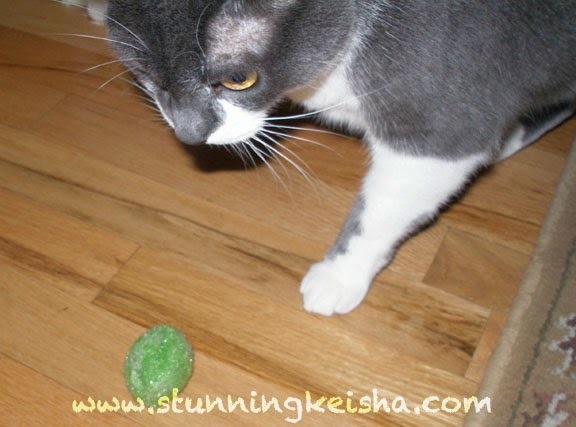 I’m thinking my green ball must be magnetic cos TW can’t walk close to it without stepping on it. Her foot is magnetically drawn to that ball. Even when she sees it and tries to step around it, she still lands right on it. Yes, there were replacement balls. The first was from Petland Discounts. While I played with it, it never quite fit the bill. Then she bought a package of animal-print balls, knowing full well that her and Pop would never see them on the carpeting in the hall. 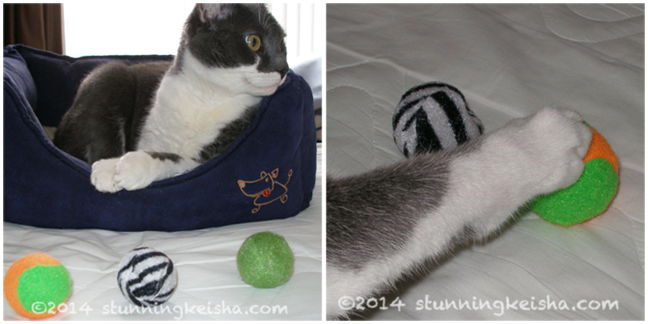 The zebra-print ball was not on the rug for a half hour before it ended up crushed under TW’s big foot. Now it’s out of shape and slow much like she is. Do you have a favorite toy you couldn’t live without? 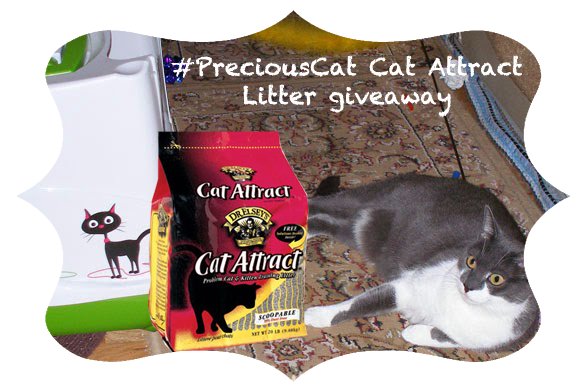 Don’t forget to enter the giveaway for a 20-lb bag of Cat Attract litter. The giveaway will be open until April 10. Prizes are limited to one winner per household. Winners must be 18 years of age and reside in the U.S. Winners will receive an email to provide delivery instructions. Prize delivery can take 6-8 weeks. No purchase is necessary. Glad you found your ball! Around here it's the red spotted mousie with the sleek silky tail. It disappeared for a while and when Mommy found it in the closet there was much rejoicing! Great news that your fav ball has been found CK. Just in time for the season we say. Have a marvellous Monday. BALLS! never heard of such things! LOL! We sure are glad you found your green ball! We don't have to worry about Jan stepping on our toys. The dogs eat them first. Hi sweetheart, I was just taking some small ball toys out of my wooden puzzle box. I have a video I made mom do but so don't know how to post it. I am sure glad to see the return of that favorite green ball CK! I'm glad you found your green ball. It looks very nice ball! Enjoy your ball and fun baseball season! YES! on Opening Day! We're excited here, too! GO TIGERS! And we'll watch a few Yankees games too. After all, it's Jeter's last year! Wouldn't want to miss seeing some of him. Good news about your favorite toy! We like our Yeoww nip fish and especially like rubber bands, although we are not left alone with them because Mickey Mouser likes them too much... he thinks they are delicious. So glad you found your ball!!! That is breaking news for sure!!!! And we huskies you had a great weekend! maybe your ball came out because baseball season started? Good luck to your Yankees...they are gonna need it! MOL! Glad you found your ball. I was scared of balls because I got hit on the nose by one when I was a baby kitty and it left me with a whistley nose. I got a very soft rubber one in a Secret Paw 2 years ago and I love that one. My very favourite toy is my ferret. Glad you found your ball, CK! We love the foil crinkly balls here in our house. They get lost all the time though. There are probably HUNDREDS that are "lost" around here. Thankfully they are super cheap, so mom keeps buying more. Then when a couch or other piece of furniture gets moved, we find MORE! That is the best. Too bad TW smushed your ball, CK. We like those balls too...but they usually end up under the china cabinet and the mom hasn't fished them out for us. BTW, our Tigers opened today....with a victory! Though JV didn't get the win. 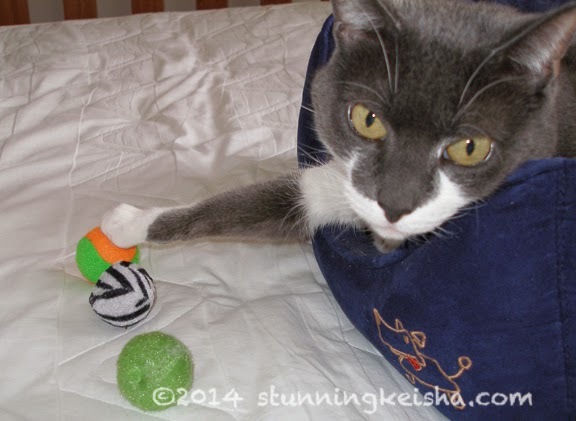 CK I like playing with crinkle balls, but my favorite thing is the neko fly Momma bought me! OH boy OH BOY oh BOY do I love playing with that!!! Glad you found your favorite toy!! Saku lubs his squeaky wand toy. It squeaks when he bites it, or when he carries it around. My Giants are cruisin' for a losin' in the desert even as we type. Sigh. Too bad your ball got stepped on. My Human steps on ALL my toys. Hisssssssssss. Beef, water, cornstarch, a bit of lemon juice to preserve color. Chicken & turkey flavors, the same. Enjoy the game tonight! It is sure going to be hard to see Jeter go. Guess what? Guess what?? Guess what????? My Giants pulled it out last night! Buster, m'boy! You da MAN! We hope your team has a pawsome season, CK. And tell TW that the photos of your paws and the balls are great!!! Sigh. Didn't last though. They blew a 4-0 lead and lost. Stoopy Giants. Woo hoo, so glad your favorite green ball turned up! LOVE your balls! My favorite used to be a mini baseball!